The Decision Counseling Program is a new type of patient decision aid which was developed by Dr. Donald Myers at Thomas Jefferson University. Prior to this program, decision aids were comprised of either educational handouts, booklets, or videos all of which were intended to deliver information to patients. The way that this program differs from previous decision aids is that a nurse educator uses the program not only to provide information about their options, but to also identify and weigh the importance of things that matter to the patient such as the side effects of treatment. 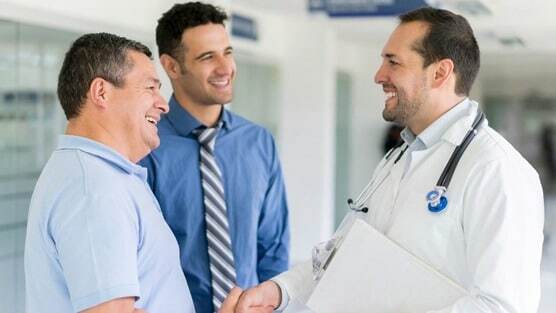 The program gives patients time to consider their options and discuss their thoughts and concerns with a physician. In turn, this provides patients with more of a voice in the entire process. In developing the program, researchers recruited 30 prostate cancer patients who had localized, low-risk prostate cancer and who were candidates for active surveillance. After participating in the Decision Counseling Program, patients had a higher level of knowledge about their treatment options, reported feeling less conflicted about the treatment decision, and had more favorable perceptions of active surveillance than they did at the outset of the study. Ultimately, 25 of the 30 participants, or 83 percent, decided to initiate active surveillance, a rate much higher than that typically observed in clinical practice. “The power in the approach is that it gives the patient time to consider the options, put personal thoughts and concerns on the table, and have a voice in the decision making process,” says corresponding author Amy Leader Dr.P.H., M.P.H., Assistant Professor of Medical Oncology and researcher at the Sidney Kimmel Cancer Center at Jefferson. Although the Decision Counseling Program was implemented primarily for addressing prostate cancer treatment decision making for this study, the system can also be applied to other areas of medicine in which “options are available, decisions are difficult, and the stakes of decision making are high,” as the press release read. “Another example of where this tool may be useful is in helping patients decide whether to participate in clinical trials. It’s work we’ve already started,” says Dr. Myers. The results were published online July 15th in the Journal of Cancer Education.